Cardinal Pedro Barreto, S.J., center, Fr. Roberto Carrasco, O.M.I. far right. Father Roberto Carrasco, O.M.I. is a Peruvian Oblate who at present lives in Rome, pursuing graduate studies in Social Communications. As a native of Latin America, it is not surprising that he has a great interest in the people who live in the Amazon region and how they are being impacted by climate change. 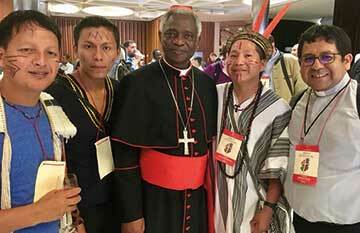 He is currently active in planning for next year’s Synod of Bishops for the Pan-Amazon Region. “Recently, in the city of Quito, Ecuador I had the pleasant experience of exercising the task of a professional journalist, at the Pan Amazonia Church Network (REPAM). This network is an initiative born in September 2014 in Brazil, to publicize all the work of the Church in the countries that make up the Amazon Region. This network is all about responding to the great challenges that the Catholic Church faces in these lands of Latin America. The network is a response to the Church’s developing efforts in its evangelizing task among the people that inhabit this vast region of the world. With the encyclical Laudato Si, REPAM has found sufficient motivation to articulate the missionary work of the Church, concerning issues such as the promotion of human rights, alternatives for development, communication, research, etc. It is also an ecclesial initiative that was born in the Amazon to protect creation and those who inhabit it. Thanks to Cardinal Pedro Barreto, S.J., who guided me in my interests and encouraged me to carry out my internship in REPAM, I was able to delve more deeply into the task that the whole team of lay and missionary professions of REPAM has undertaken, in anticipation of the next Special Synod of Bishops for the Amazon. The Synod, scheduled to meet in Rome in October 2019, will seek new ways for the Church to favor an integral ecology. I have joined the efforts to work on the international campaign to “Amazonize” the Church – by generating communications materials and messages that generate awareness and understanding of the contents of the preparatory document of the Pan Amazonia Synod. In addition, it strives to develop strategies for planning and programming that are being worked out in Territorial Assemblies as part of the pre-synod process. These involve bishops, priests, missionaries, religious, laity, indigenous peoples, civil organizations and institutions concerned about the situation of the whole Pan Amazon.